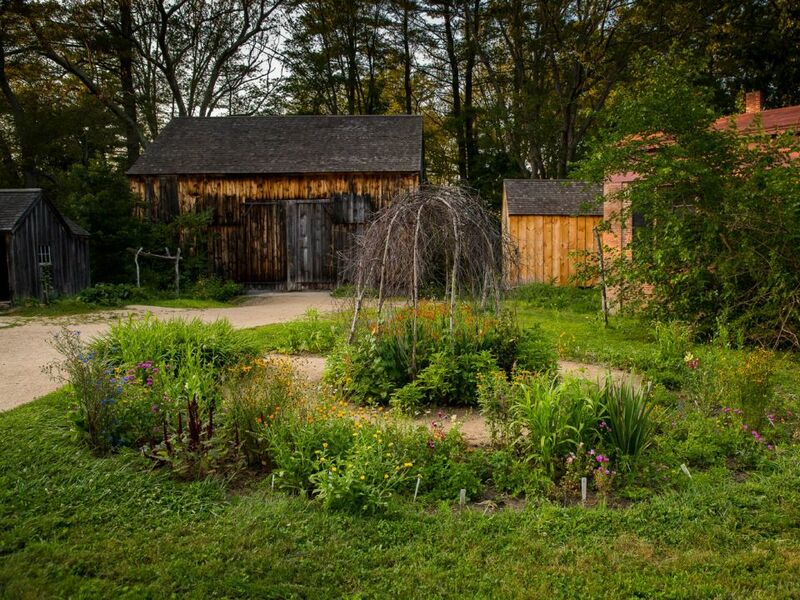 The circular flower bed is based on a plan described in an 1833 children’s book, The Young Florist, by Joseph Breck, a Boston-area horticulturalist. Breck recommended developing and tending a flower garden as a valuable educational activity for young people. He described a large selection of annual, biennial, and perennial flowers, provided information on their origins and history, and gave directions for their culture. The layout and plant selection in the Fitch Garden follow Mr. Breck’s suggestions. Tulips and narcissus in the center circle and heartsease and clusters of crocus in the outer ring highlight the early spring display. A rustic arbor of birch poles twined with morning glories, sweet peas, and scarlet flowering beans dominates the center of the garden. Balsams and four o’clocks add their height to the center arrangement. Native wild plants, such as cranesbill geranium and columbine, grow side by side with coreopsis, newly introduced to New England gardens through the westward explorations of Thomas Nuttall. “Curious” plants held a strong appeal for 19th-century gardeners: mimosa with its strangely sensitive leaves and Job’s Tears with its unusual seeds enliven the children’s garden. Reliable old favorites—sweet William, pot marigold, blue bottle, alyssum, and sweet violets—self-sow to reappear and bring color to the season’s display.